Clark had come to visit the scene of this attack just days after the event, says Charlotte Taylor. Here, it is still in progress. Against the seawall, some of the territorials lie fallen while others, in their khaki greatcoats, are urgently struggling to put up a defence, which was hampered by the position of the lighthouse. People are fleeing. A woman carrying an infant rushes away on the far right, in the shadow of a wrecked seafront building, with the word most of the word "Cafe" visible on the frontage. Some timber lies in the road. 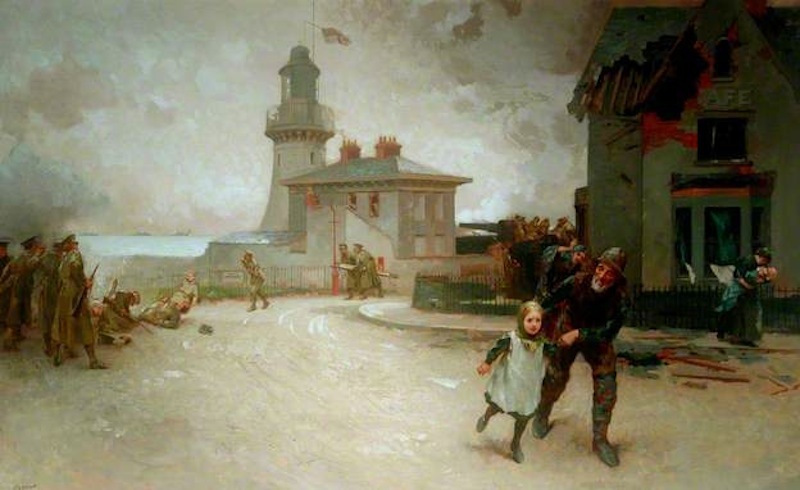 But the main focus, apart from the central lighthouse bravely flying its flag, is a fisherman hurrying a little girl from the frightening scene, and, he hopes, from danger. Another person can be seen running behind him on the right. Clark would have known some of this, but, as with The Great Sacrifice, he does not attempt to show the full ugliness of war. Instead, by focusing on the fisherman's attention to his charge, and the mother's to her infant, he dwells on how the human spirit, at its best, can rise above the immediate predicament in its concern for others. As he had hoped, the painting came to sum up the horrors of the Bombardment and record it for future generations. Chrystal, Paul, and Simon Crossley. Hartlepool through Time Stroud, Gloucestershire: Amberley, 2013 (ebook).